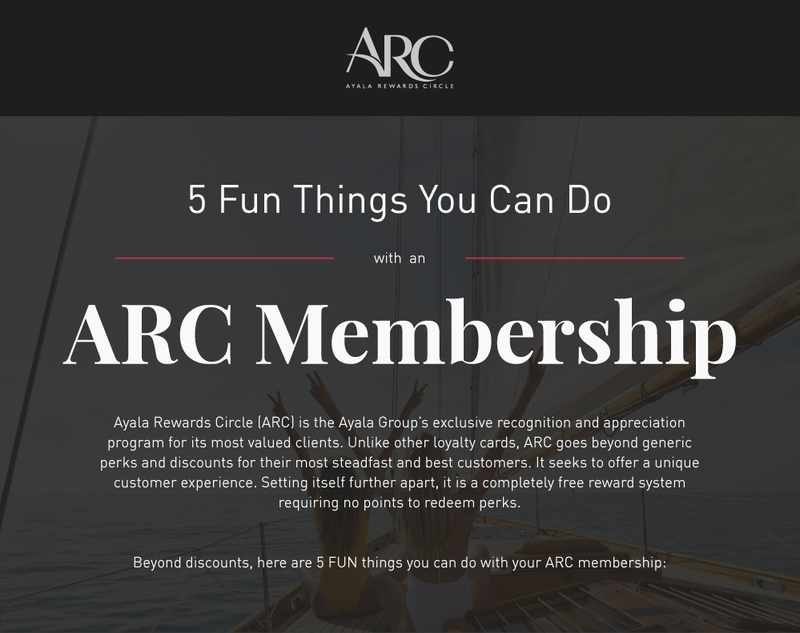 Ayala Rewards Circle (ARC) is the Ayala Group’s exclusive recognition and appreciation program for its most valued clients. 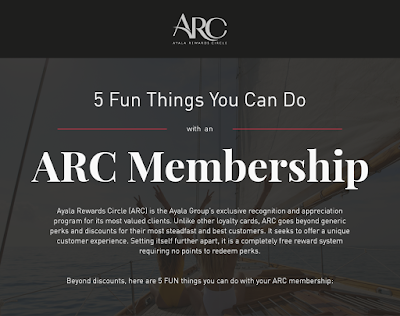 Unlike other loyalty cards, ARC goes beyond generic perks and discounts for their most steadfast and best customers. It seeks to offer a unique customer experience. Setting itself further apart, it is a completely free reward system requiring no points to redeem perks. Travelling is fun, but can also be exhausting when you have to worry about everything else, be it booking a hotel, flights, or local transportation. 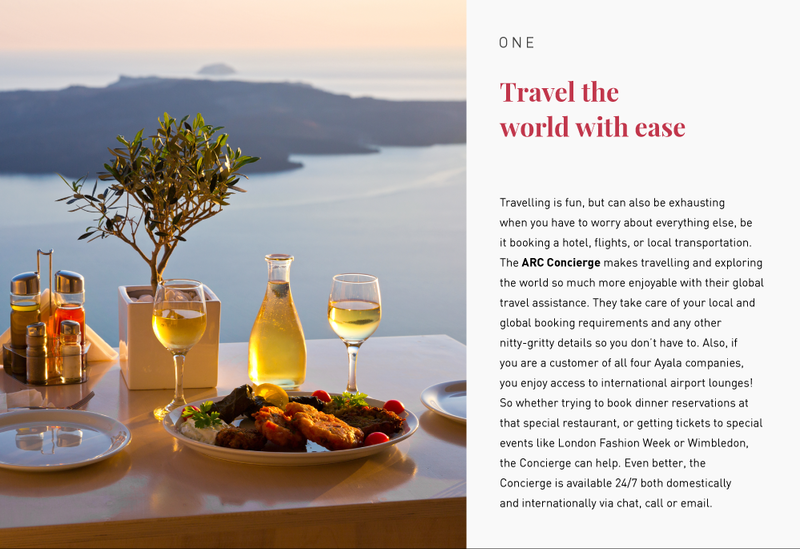 The ARC Concierge makes travelling and exploring the world so much more enjoyable with their global travel assistance. They take care of your local and global booking requirements and any other nitty-gritty details so you don’t have to. Also, if you are a customer of all four Ayala companies, you enjoy access to international airport lounges! So whether trying to book dinner reservations at that special restaurant, or getting tickets to special events like London Fashion Week or Wimbledon, the Concierge can help. Even better, the Concierge is available 24/7 both domestically and internationally via chat, call or email. 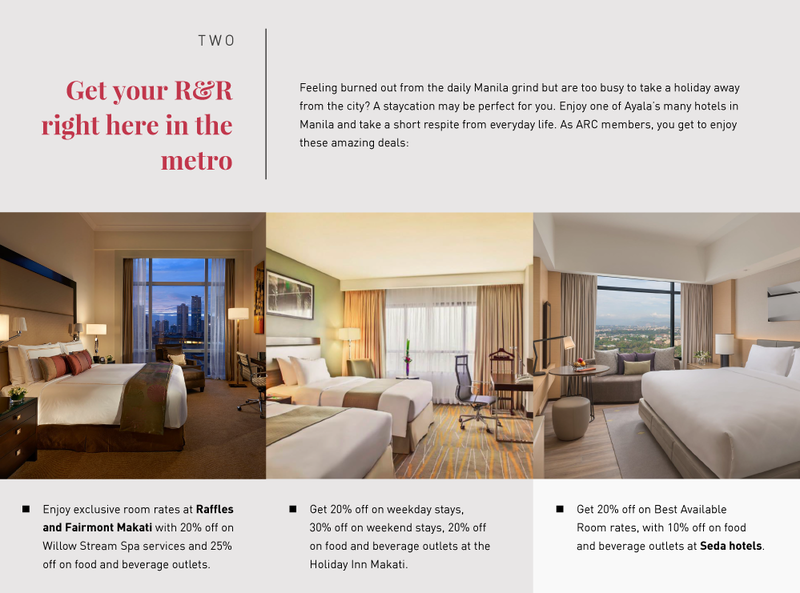 Enjoy exclusive room rates at Raffles and Fairmont Makati with 20% off on Willow Stream Spa services and 25% off on food and beverage outlets. Get 20% off on weekday stays, 30% off on weekend stays, 20% off on food and beverage outlets at the Holiday Inn Makati. Get 20% off on Best Available Room rates, with 10% off on food and beverage outlets at Seda hotels. 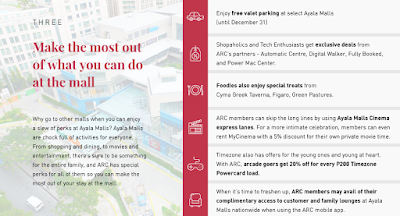 Why go to other malls when you can enjoy a slew of perks at Ayala Malls? Ayala Malls are chock full of activities for everyone. From shopping and dining, to movies and entertainment, there’s sure to be something for the entire family, and ARC has special perks for all of them so you can make the most out of your stay at the mall. Shopaholics and Tech Enthusiasts get exclusive deals from ARC’s partners - Automatic Centre, Digital Walker, Fully Booked, and Power Mac Center. Foodies also enjoy special treats from Cyma Greek Taverna, Figaro, Green Pastures. Like movies? 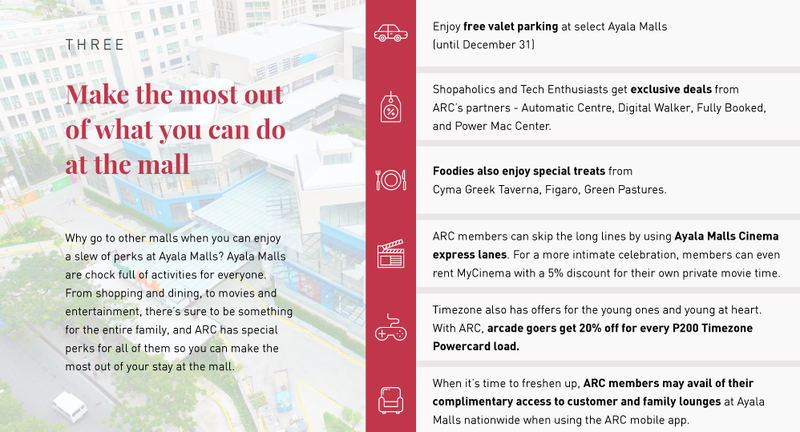 ARC members can skip the long lines by using Ayala Malls Cinema express lanes. For a more intimate celebration, members can even rent MyCinema with a 5% discount for their own private movie time. Timezone also has offers for the young ones and young at heart. With ARC, arcade goers get 20% off for every P200 Timezone Powercard load. When it’s time to freshen up, ARC members may avail of their complimentary access to customer and family lounges at Ayala Malls nationwide when using the ARC mobile app. Take a stroll through time and get a deeper understanding of the Philippines’ rich culture through art and history. And what better way to appreciate history than to get up close and personal with the works of renowned masters at Ayala Museum. The Ayala Museum, located at the heart of the Makati Central Business District, Philippines, is a sanctuary amidst the hustle and bustle of Metropolitan Manila. Lose yourself in amazing contemporary art and uplift your spirit through the Philippines’ inspiring history. 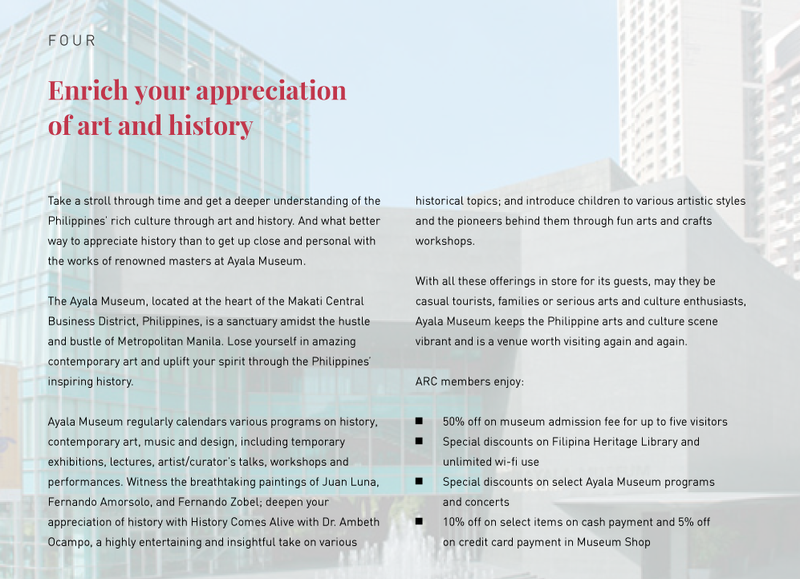 Ayala Museum regularly calendars various programs on history, contemporary art, music and design, including temporary exhibitions, lectures, artist/curator’s talks, workshops and performances. Witness the breathtaking paintings of Juan Luna, Fernando Amorsolo, and Fernando Zobel; deepen your appreciation of history with History Comes Alive with Dr. Ambeth Ocampo, a highly entertaining and insightful take on various historical topics; and introduce children to various artistic styles and the pioneers behind them through fun arts and crafts workshops. 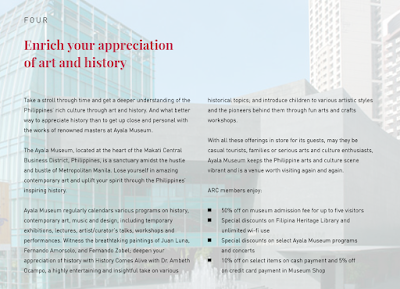 With all these offerings in store for its guests, may they be casual tourists, families or serious arts and culture enthusiasts, Ayala Museum keeps the Philippine arts and culture scene vibrant and is a venue worth visiting again and again. 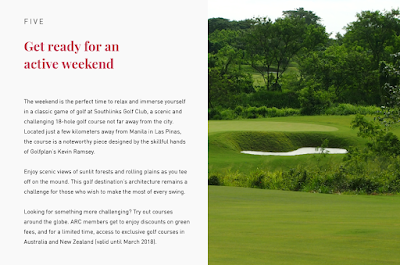 The weekend is the perfect time to relax and immerse yourself in a classic game of golf at Southlinks Golf Club, a scenic and challenging 18-hole golf course not far away from the city. Located just a few kilometers away from Manila in Las Pinas, the course is a noteworthy piece designed by the skillful hands of Golfplan’s Kevin Ramsey. Enjoy scenic views of sunlit forests and rolling plains as you tee off on the mound. This golf destination’s architecture remains a challenge for those who wish to make the most of every swing. Looking for something more challenging? Try out courses around the globe. ARC members get to enjoy discounts on green fees, and for a limited time, access to exclusive golf courses in Australia and New Zealand (valid until March 2018). For more information, visit www.ayalarewardscircle.com or https://www.facebook.com/ayalarewardscircle.